Ahhh, knives…the unsung hero of the kitchen. The right knife can make prepping a breeze, and the wrong one…well, we’ve probably all been there. They help professionals and at-home enthusiasts alike create works of art, and let’s be honest – some are works of art in their own right. But how does one know which knife to choose? Which knife will effortlessly have you slicing paper thin slivers of sashimi like a sushi master and dicing onions quickly and tearlessly like a pro? We’re on a mission to find out (and we’re the first to admit that we need all the help in the kitchen we can get). We headed to a Middle Eastern authority on top-of-the-line kitchenware, Tavola, to find one to put to the test. They have a plethora of beautiful blades, but the breathtaking Miyabi range immediately caught the attention of our magpie eyes. Our choice? The Miyabi 5000MCD Birchwood chef’s knife. It’s been called ‘The Ferrari of Kitchen Knives’, and for good reason. The 5000MCD contains a core of SG2 (very hard steel), sandwiched between two outer layers of 100 folds of softer Damascus. (Fun fact: the blade rates a 63 on the hardness scale, very impressive.) Why do this, you might ask? Why not just make a knife as hard as it can be? The answer is pretty interesting. The combination of the softer outer and tougher inner means the knife blade will be less resistant to chipping. The last thing you want is your beautiful new blade ‘blowing a tire’. When it comes to size, whilst the common mantra in life leans towards the ‘bigger is better’ side of things, this doesn’t always ring true when it comes to knives. If you’re a pro chef, you can probably wield the 24cm model. But for at home enthusiasts? The Tavola experts advised we’d be better to choose the 20cm (which we did). It’s much better sized for everyday use, domestic kitchen countertops and chopping blocks – plus you won’t need the arm strength required to wrangle the 24cm version. Crafted from every knife-geek’s favorite, Damascus steel, the Miyabi knives had us swooning from the get-go – it was love at first sight. For those of you who aren’t Forged in Fire devotees (if you haven’t watched this amazing blacksmithing competition show on the History channel, you’re missing out FYI), Damascus is revered for both its strength and its inimitable beauty. Layers of steel billets are sandwiched and folded together to give these blades their unique properties, and they’re instantly recognizable – when you see layers upon layers of those wonderful wavy lines, it’s Damascus. Miyabi translates to refinement or elegance, and that ethos is clear in the design. The brand hails from Seki, Japan, famous for its long history of blade craftsmanship, and it’s clear they know more than a thing or two about expert blade construction. The handle is carved from birchwood, famously used in Faberge eggs, and the handle has a full tang (this means the ‘tang’, or ‘handle’ of the blade extends from the same piece of steel as the blade section of the knife itself) – essential for long lasting strength. 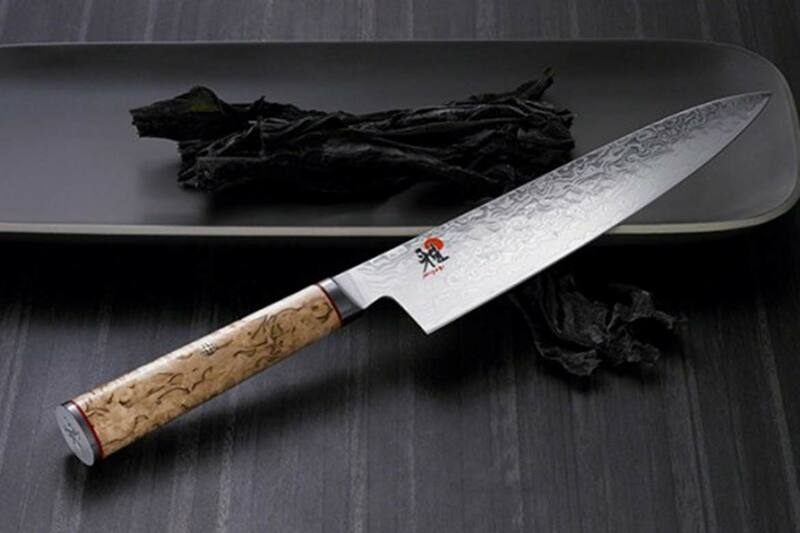 The mosaic pin in the blade is drool-worthy, and the end cap of the handle beautifully displays the Miyabi logo. Let’s face it, this is a gorgeous knife. One of the other noteworthy features of the design of this blade (apart from that to-die-for Damascus) is its perfect balance. Hold the knife on one finger next to the handle and it balances perfectly, blade and handle equally weighted. This means it delivers a better experience when chopping, and the handle gives superior comfort too – despite the grip looking rather straight, this is a knife that feels great in the hand and it’s also super light. When it comes to sharpenss, it’s hard to beat the Miyabi 5000MCD Birchwood. It has a 9 degree cutting angle (most chef knives will be around 15 degrees), allowing you to get that YouTube-worthy handsfree paper thin tomato slice. Seriously. This knife cuts through anything from veges to chorizo like butter – you’ll be absolutely gobsmacked. This knife has a cutting edge that runs the entire length of the blade (the ENTIRE length from handle to tip) and it’s so sharp we even cut ourselves just getting it out of the box (yes, it’s THAT sharp). It’s also got a lifetime warranty, so put that receipt in a safe place (not that we think you’ll need to use it). Is it cheap? No. A Ginzu knife this is not. Is it value? Yes. This is a wise investment that will bring you a lot of joy for decades. There’s a saying when it comes to tattoos – ‘Good work ain’t cheap, and cheap work ain’t good’. The same applies to your tools in the kitchen. Take care of this baby and it will last you a lifetime – and the Miyabi will require minimal sharpening too, a plus for all of those who aren’t great at sharpening knives ourselves or who just plain forget to get their knives professionally sharpened (though that’s always a great idea). Pit it against bones. No, no, no. Use a cleaver, not your beautiful Miyabi. Don’t risk chipping or denting that edge! Put it in the dishwasher. This baby is hand wash only. Leave it wet. Always dry your blade straight away! Put it in your cutlery drawer. Make sure you preserve your blade edge by storing it individually – a wall mounted magnetic frame might be ideal, we think, or in a suitable knife block or roll. The Miyabi 5000MCD Birchwood is a top of the line knife that will not only stun when it comes to its beauty and artistry, but also with its performance. We’ve seriously analysed and tested this knife and emphatically give it the Luxeologist seal of approval. Head to Tavola UAE to pick one up for yourself – it retails for 1,182dhs which is a total bargain – Tavola have thankfully priced it so you’re getting one of the best prices around the world for this knife – and you won’t have to worry about any of that pesky shipping (c’mon Dubaians, we know how hard it is to get stuff shipped here – plus VAT now). We at TheLuxeologist are in love with this knife and we know you’re going to be absolutely over the moon having it in your kitchen. Don’t forget to send us your pics of you and your knife, and what you create with it! Which knives would you like us to review next? Let us know in the comments below!